Meet our Family Team Members! 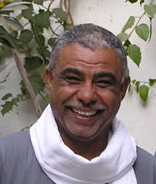 Hamdy was born in the spring of 1956 in the village of Gezirat el Bairat on the West Bank of the Nile in Luxor. At the age of 7 he started working, after school, with the neighbour’s donkeys, bringing tourists to the Valley of the Kings and Queens to see the tombs of the old Thebes. At the age of 17 he started working as a tour operator, transferring guests to and from the Luxor airport. Once he had acquired his own driving licence he worked as a taxi driver. This until 1977. It was then that he met a well-known Egyptologist who was working on one of the many excavation sites in Thebe. He became his personal assistant and driver. During his work with this Egyptologist he came into contact with a filming crew of the BBC, who were on location for a documentary. They quickly realised that Hamdy knew all the good places in the area and the best times of the day for perfect light. Hamdy also knew how to accommodate even the most demanding requests and so they asked him to support their crews as ‘their man’ in Egypt. For many years, until today, Hamdy has continued to do so for not only the BBC, but also for ZDF, ARD, Discovery Channel and many more. He has also assisted a number of authors of books about the history of ancient Egypt during their assignment as a driver, guide and organiser for all kinds of permissions needed to enter sites generally undisclosed to the public. Hamdy’s contacts are numerous and his knowledge about the old Egypt as well as the new Egypt is immense. It was 1983 when a Frenchman lead Hamdy for the first time in his life into the desert west of Luxor. He fell in love with it at first sight. The two followed the trails of the old camel treks from Sudan. One year later, with the same Frenchman, he ventured into the Western Desert of Egypt up to the Oasis of Dakhla. There were no paved roads then and only a handful of people knew how to get there. To this day Hamdy has shared his love for and vast knowledge about the Western Desert and his country with many people from all over the world. His friendship with the Bedouins, his calm and charming personality, his good sense of humour and his philosophy in dealing with his guests, make an adventure with Hamdy an unforgettable one. Since 2008 in Egypt started to change things. The increase of tourists visiting Egypt made the Egyptian Government decide to accentuate the rules for people working in the tourist industry. Licenses and more and more paperwork were needed to arrange things. It made Hamdy decide to open a small travel company, Rahmah Travel, and work officially, so his guests could feel save when travelling with him. His two sons are participating in this company too. Zeinab was born in 1961 in the village of El Gourna. She is the wife of Hamdy, mother of their 6 children and the Head of all Domestic Affairs. She runs the household like a professional housekeeper and nothing is too much trouble for her. Hamdy and Zeinab are the perfect example of Egyptian hospitality. The apartments they are renting out at the family home are comfortable, the plentiful food is typical local Egyptian cuisine and everyone is encouraged to make themselves at home in this friendly family. Emad, the first born son in the Mosa family, specialises in city trips. No one knows Cairo like he does. You name it, he gets it done or brings you there. His ability to find the good places at the best prices is legendary. He’s very experienced in organizing belly dance tours. You will never enjoy night life like you do with Emad and when he organises a felucca trip, you can be sure it’s the best money can buy. Being born into a family where international guests are an almost daily occurrence, Mohamed is at ease with people from different cultural backgrounds. He is a very good driver and like his father, he knows many ways to get there. He loves very much the television work. With Mohamed you can climb every mountain and find the most beautiful spots. In Egypt usually the daughters leave the home when they get married, to live with the in-laws. When the sons get married, they stay at the family home. This means, that both of Hamdy’s sons, Emad as well as Mohamed with their wife and children, live at the family home at the Luxor West Bank.